Medicine Hat has had no fires and Clugston says they are keeping their hands on the rudder. But without a clear benefit to the customer Medicine Hat, like so many other places, has allowed people to dominate the debate with specious claims about electromagnetic radiation, state surveillance and the like. Smart meters are unabashedly good. This might seem like an uncontroversial statement but start poking around some of the kookier parts of the internet and you'll quickly learn that smart meters are apparently responsible for everything from cancer to spying on you every minute of every day. A smart meter is a relatively simple piece of equipment compared to the stuff we carry around in our pocket. It collects hourly data on your electricity consumption and uploads that data to your electricity provider wirelessly over the course of the day. A smart meter replaces the meter reader that would come around your backyard every couple of months. More than 6.7 million smart meters have been rolled out all across Ontario and British Columbia and other parts of Canada. We went to Medicine Hat one of the, first places in Alberta to roll them out. They've installed 26,000 smart meters. Wilbur McLean, a communications officer with the City of Medicine Hat, says approximately 20 per cent of the time people's bills are estimated. This number can be much higher in other places which means the cute little graphs on your bill aren't as accurate as you might assume. With smart meters customers can login online and monitor their actual electricity consumption, hour by hour. 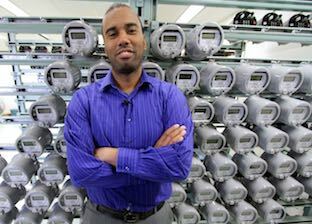 Wilbur McLean, a communications officer with the city of Medicine Hat, stands in front of a bank of smart meters. Medicine Hat has a forward looking civic utility but their initial motivation was to save money. "Originally it was a cost-benefit analysis. The utility is looking at saving consumers costs and that was our motivating factor," says Mayor Ted Clugston who says the meters will pay for themselves in seven to eight years. Smart meters save utilities money by saving on labour costs, they can help find weak points and they help the utility plan better and perhaps even defer capital investments. When you hear about Big Data this is it -- a smart meter takes 8,760 meter readings per year instead of six to 12. And smart people and companies are working with that data to conserve energy. We talked to Ecotagious, a small Vancouver based company that works with utilities to encourage energy conservation by parsing and analyzing smart meter data. "Because the utilities were collecting 720 times the data that they used to collect with smart meters we thought there was an opportunity to help people and provide more feedback on their electricity use so they can make their own choices on whether they want to conserve or not," says Ecotagious CEO Bruce Townson. Ecotagious is able to separate out the big loads -- air conditioners, electric space heating, pool pumps and vampire loads. 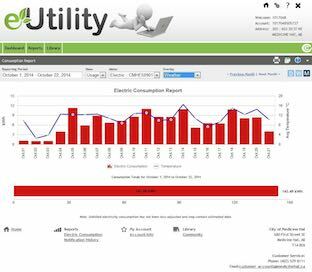 They use the smart meter data, their own algorithms and other publicly available data to generate a custom report for each customer breaking down their use by appliance and depending on their usage patterns gives them tips if they want to conserve energy. In a four-month pilot program run in Sudbury last winter they achieved a four per cent reduction in electricity use compared to a control group. And while four per cent may not sound like much, in the utility world typical conservation programs are very happy to get a one per cent reduction. The utility they ran their pilot with quickly signed up and they now have several customers in Ontario. "If you can show people value, help them conserve if they're inclined to then customer satisfaction goes way up," says Townson. "It's visible, it's direct, it's tangible you're seeing the results of it right there." While Medicine Hat has the very successful Hat Smart energy conservation program they too have endured some blowback over smart meters. Thanks to half a dozen fires associated with meters in Saskatchewan and some plain old resistance to change the meters have been a source of controversy. But as Medicine Hat Mayor Ted Clugston explains the city took great care installing the meters. They inspected and photographed each replacement situation and took care to note any risks. "So what happened, and I'm going to be blunt, politicians overreact, politicians are weak, they're reactive rather than proactive. So they had six fires in Saskatchewan, we have the same meters here. Fires aren't caused by the meters they're caused by the sockets on the homes so actually analogue meters start on fire as well when you change them out," says Clugston. Medicine Hat has had no fires and Clugston says they are keeping their hands on the rudder. But without a clear benefit to the customer Medicine Hat, like so many other places, has allowed people to dominate the debate with specious claims about electromagnetic radiation, state surveillance and the like. Its services like Ecotagious that can head help both consumers and utilities benefit from the new technology. And by making your smart meter even smarter companies like Ecotagious can save utilities from themselves. "If you can show people value, help them conserve if they're inclined to, then customer satisfaction goes way up," says Townson. "It's visible, it's direct, it's tangible and you're seeing the results of it right there."